It’s been a crazy four years since I attended my first SMX Advanced, in Seattle. While some things remain constant, so much has evolved in the land of SEO, SEM, social media, attribution, and mobile. For a long time, video has been one of my favorite ways to easily break into Page 1 in the Search Engine Results Page (SERP). Now, Rich Answers provide another great option to help dominate those first page results. Eric Enge conducted a study of almost 900,000 different queries and found that around 20% of the time, Google served up a Rich Answer. Rich Answers are the answer boxes that appear at the very top of the page (yes, even above sites like Wikipedia) when a commonly asked question is searched on. It can display in a variety of ways, including tables, tabs, lists, charts, even drop down menus. Having a rich answer result allows your site to leap over all other results and significantly increase traffic to your page, even if you have a domain with lower authority. So how do you get a Rich Answer? Rich Answers require you having a dedicated page on your website that provides a simple, clear answer to a question. Your content should not just focus on a keyword or phrase, but the context of it. 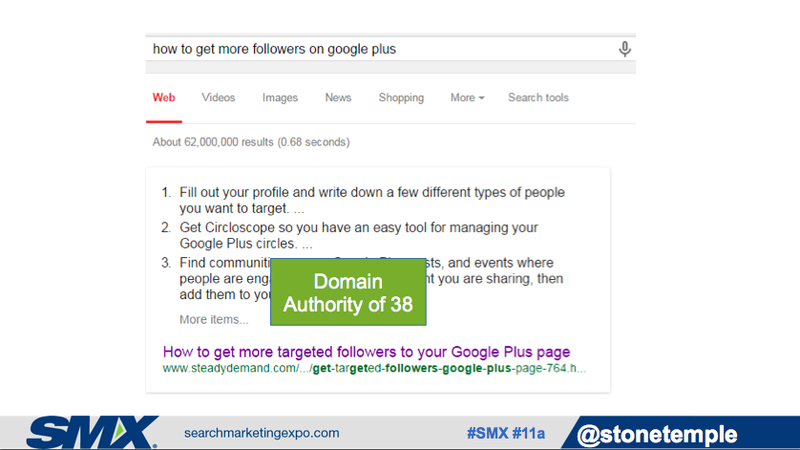 Eric managed to get a Rich Answer result in the SERP within 3 days of publishing it. As part of the content, he shared the page on Google+ and submitted the URL through Google Search Console (aka Webmaster Tools). Testing is such a broad topic that sometimes it can be difficult to know where to focus. With many years of experience under his belt, Ryan Hutchings shared an extremely practical framework when it comes to testing the things that are going to make a difference. When you are looking to make improvements, you test things that fit within the equation (see above). I’ve used gap analysis for a lot of things, but for some reason SEO has rarely been one of them. 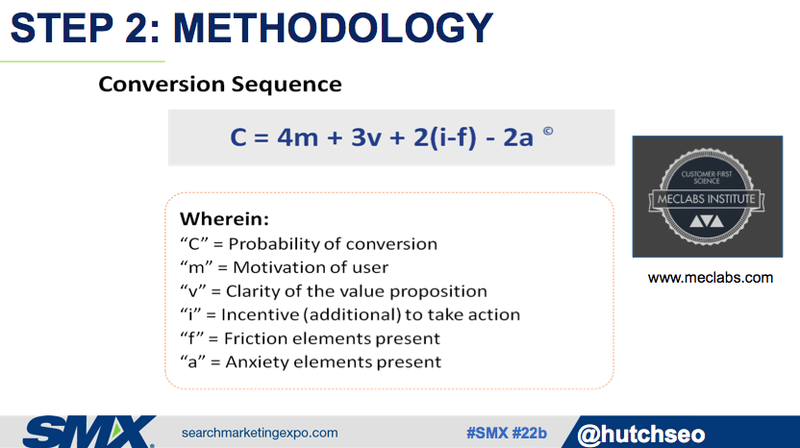 Jessica Bowman shared a wonderful way to use gap analysis that can be used to simply communicate SEO objectives, priorities and progress to management. It is particularly useful if management feels that SEO progress is taking longer than expected and are asking, “What happened?”. You then roll up these tactical scores and apply to the framework in order to illustrate the gaps at a higher level. 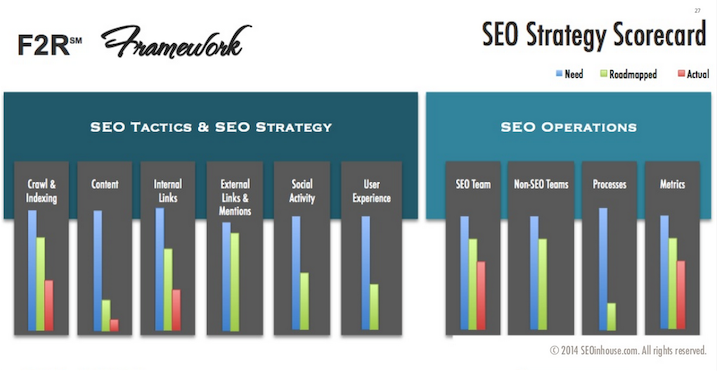 In today’s ever-evolving SEO landscape, focusing just on traditional ranking factors will only get you so far. Throughout the conference many presenters reminded us that ranking today is not just about keywords but about consumer intent, and in order to get pages to rank at the top of the results pages and stay there, you have to provide helpful, human answers to queries being made. Marcus Tober emphasized the importance of connected topics that make users happy. In order to win in SEO you have to become an authority on a topic and get the UX right first, before even thinking about link building. 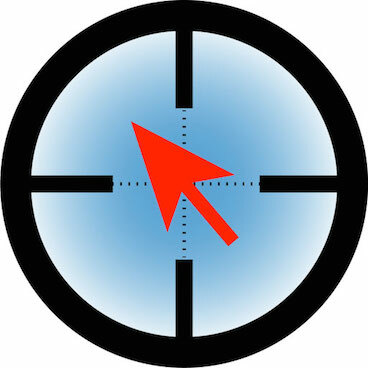 The ultimate SEO utopia is having your brand becoming synonymous with a search topic. 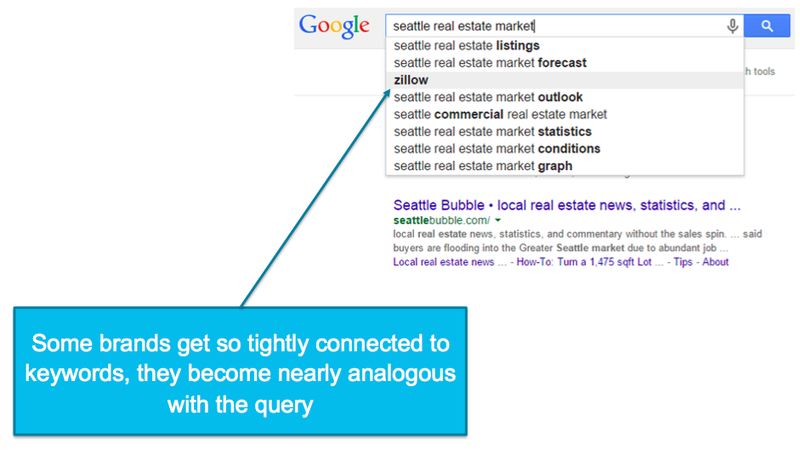 Rand Fishkin shared an example of Zillow showing up as a suggestion for real-estate searches because as a brand, it has become so tightly connected to this industry. Four years ago, no-one had an easy answer for attribution; not even close. In 2015, the attribution question continues to be a painful one. 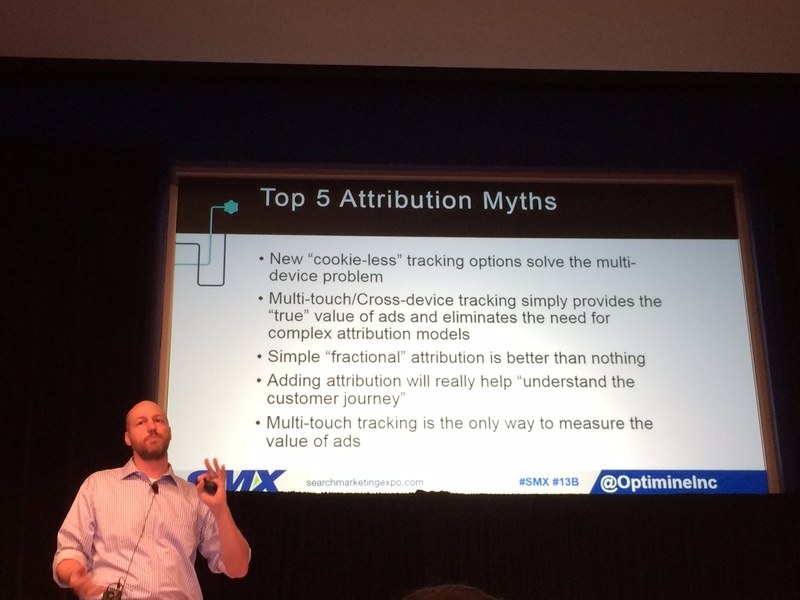 Although 88% of marketers believe that attribution is important, 66% of us still use a single touch (first or last touch) attribution model – Jeremy Hull. What makes it hard is that tracking cookies break when measuring cross-device – not so good when users own an average of 2-3 devices, and climbing with wearable technology. Google’s big focus of late has been around satisfying micro-moments of truth. Micro-moments are fragmented events that happen throughout the day that all contribute towards a person making a purchase decision. Google wants to build a great platform for every moment of commercial intent across the web, mobile and apps. If this is the case, then accurate attribution tracking has to be a big priority for Google. Google Estimated Total Conversions is a column feature in AdWords that is intended to provide insights into how ads influence conversions cross-device online, in-store or over the phone. However, it does require use of the AdWords conversion tracking tool and enough conversion volume in order to generate an “estimate” – a word that many search marketers have taken issue with. We are told that Estimated Conversions are based on very conservative estimates with a 95% confidence level. Jerry Dischler (VP Product Management, at Google) went so far to say that he trusted it 100%. Jerry confirmed that Google are focusing more on solving the attribution question – looking at both offline conversions (in particular, store visits and store transactions) and cross-device conversions. Offline visibility will be particularly important in the consumer space since recent research findings show that search is driving more conversions in-store than online. 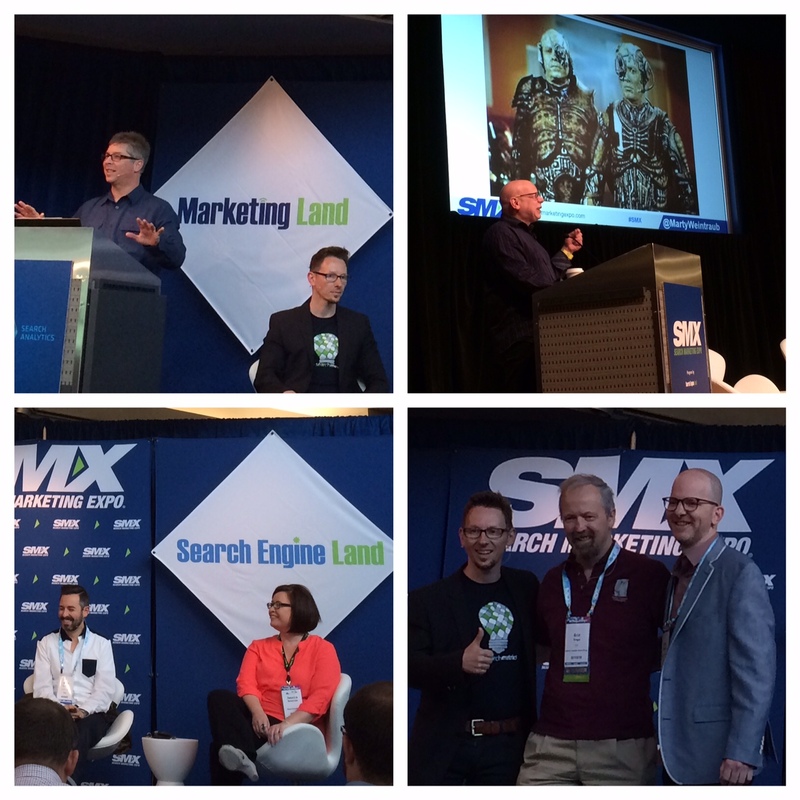 For more SMX insights, be sure to check out my Twitter feed, as well as hashtag #smx. Where Should You Host Your Video Content? With over 1B video clips being viewed on Facebook each day, video popularity shows no signs of slowing. So it should come as no surprise that the use of video in content marketing continues to rise, helped along by lowered barriers to entry when it comes to video production. 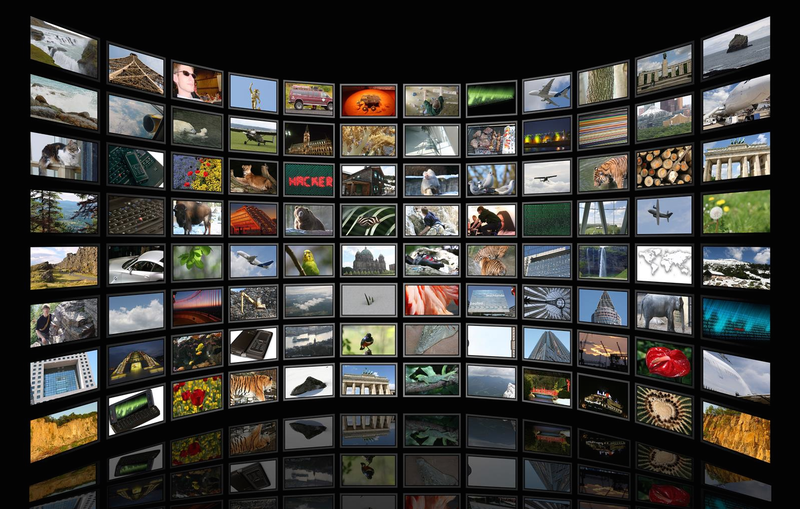 However, a question that marketers commonly ask is, “Where should my video content live? — On my website, or on a third-party video platform?” …of which there are a myriad of choices. Unfortunately, there is not a one-size-fits-all answer as choice will often depend upon a range of different factors. So let’s take a look at each option in turn, as well as take a deeper dive into five of the major social video networks out there. If you decide that hosting your video on a social video platform is the way to go, the question then turns to which network to choose? 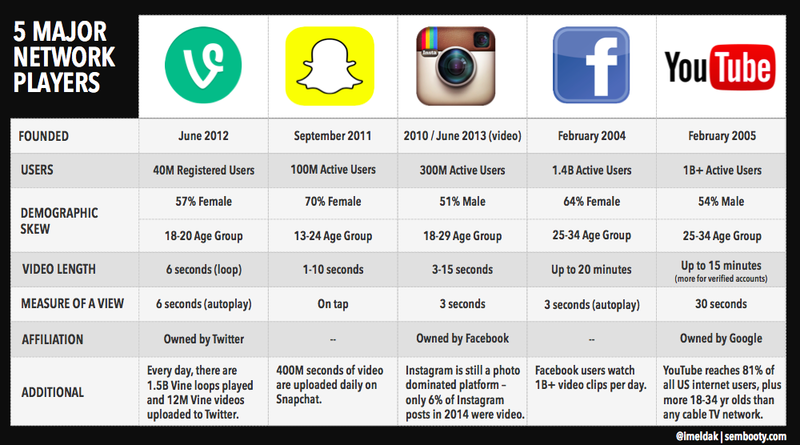 Here’s a comparison of 5 major social video networks. Vine: Vine was founded in June 2012 and then promptly scooped up by Twitter four months later. It officially launched as a mobile app in 2013 and has since clocked up 40M registered users. Vine users skew female and is most popular amongst the younger 18-20 year old age group. Users record short 6-second video clips with their mobile device camera. Stop motion video is a popular technique used on Vine due to the short filming length. Snapchat: With 100M active monthly users, Snapchat is most popular among females and younger age groups (under 25s). Users snap a photo or video, mark it up with text or drawings, and send them to a controlled list of recipients. After a certain user-defined time-limit (between 1-10 seconds), the snap will disappear. Snapchat Stories was added in 2013 leading to 1B stories being viewed per day. It provides a collection of snaps anyone can view, allowing brands to go beyond the original 1:1 limitations. 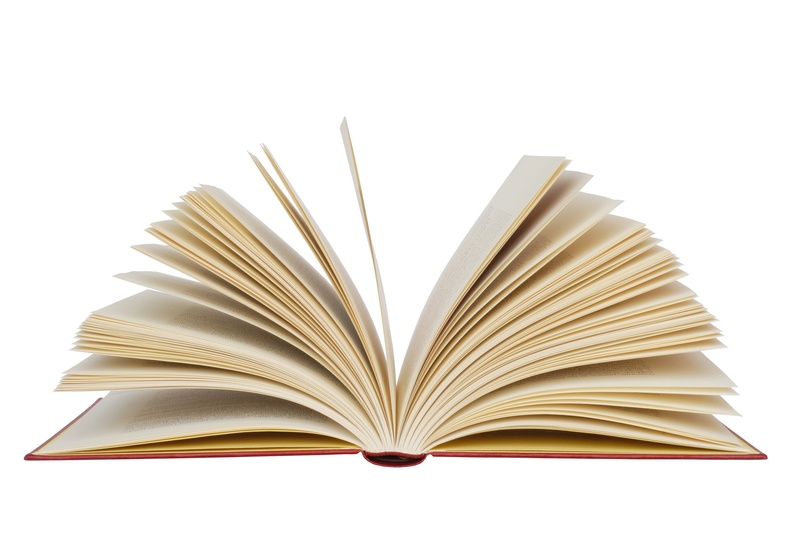 Stories can be viewed an unlimited number of times, for a 24 hour period. Despite its growing popularity, Social Media Marketing Report (2015) found that the majority of marketers (83%) have no plans to use Snapchat in 2015. Just recently, Evan Spiegal, CEO of Snapchat, also spoke negatively about brands using Snapchat Stories, outside of traditional ad units. Instagram: Originally a photo sharing platform, Instagram expanded its service to video in 2013. It has 300M active monthly users and is more gender neutral compared to other social video networks. It is most popular among the 18-29 age group. Instagram users can upload 3-15 second videos, with time-lapse being a popular technique used. Use of hashtags are also common for tagging and findability within Instagram. Facebook: With 1.4B active monthly users, Facebook continues to be the most popular social networking site out there. Facebook users skews female and while most popular among the 25-34 age group, usage continues to increase in the 65 and older age category (with 56% of Internet users in the 65 and older category using Facebook). Facebook videos automatically play without audio on a user’s News Feed. There has been much debate recently over which platform is better for video – Facebook or YouTube. The choice really depends upon your objectives. Recent research by Visible Measures found that Facebook provides much higher acceleration of views compared to YouTube due to the network’s massive reach, but these views diminish over time. On the other hand, YouTube was found to be the better choice for continued viewership over the long haul, likely helped along through stronger search findability. YouTube: With 1B+ active monthly users, YouTube impressively reaches 81% of all US internet users, including more 18-34 year olds than any cable TV network. Demographically, YouTube skews towards higher male usage, and like Facebook is most popular among the 25-34 age group. Very recently, video thumbnail results for self-hosted videos made an exit from the Google SERP. YouTube videos are now the only video thumbnails that seem to be showing up. YouTube is definitely the go-to platform for video findability, and still remains the second most popular search engine after Google. “How to” searches on YouTube increased by 70% in 2015, with over 100 million hours watched. “Near me” searches have also doubled this year. For search marketers, it is often easier to rank for educational searches in Google, using a YouTube video compared to a standard HTML page. Video optimizations are relatively straightforward to apply and can be further supplemented with paid promotions to help drive traffic and social engagement. Use cases: Spans the entire marketing funnel from how-to videos to product tear downs and ask the experts. Examples of companies doing YouTube well: There are many examples of companies doing it right on YouTube. Among the best known are Blendtek and Old Spice. What part of the funnel are you targeting? What are your website capabilities? What audience are you trying to reach and why? From the February pre-announcement to the official April 21st launch, all talk has been around Google’s Mobile-Friendly update. However, the full impact of the update is still yet to be realized for many sites – according to Google, the rollout could take weeks. With more people using mobile to find, view and interact with website information, it makes sense for Google to favor mobile-friendly sites when conducting searches on mobile devices. 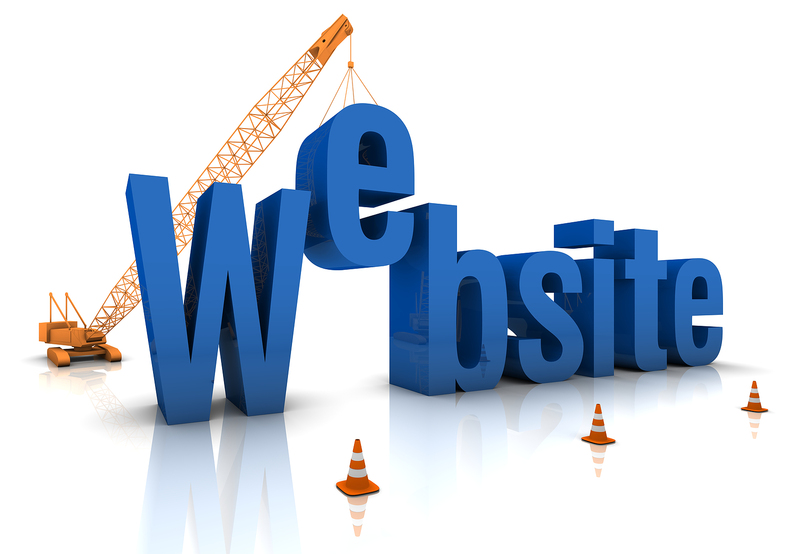 In 2015, you would expect most – if not all – websites to be responsive to the device that people are accessing them from. Though scarily, a recent study conducted by Portent suggested otherwise, with 10,000 out of 25,000 top sites failing the mobile test. The fact of the matter is, having a mobile-friendly site goes way beyond a Google algorithm update and the simple ability to see information on a smaller screen. It’s about providing users with the best possible experience wherever, whenever, and however they need to access information, taking into account the context and intent-mindset that person is in. In today’s multi-screen, multi-device, omni-channel environment, the days of linear customer journeys are but a distant memory. 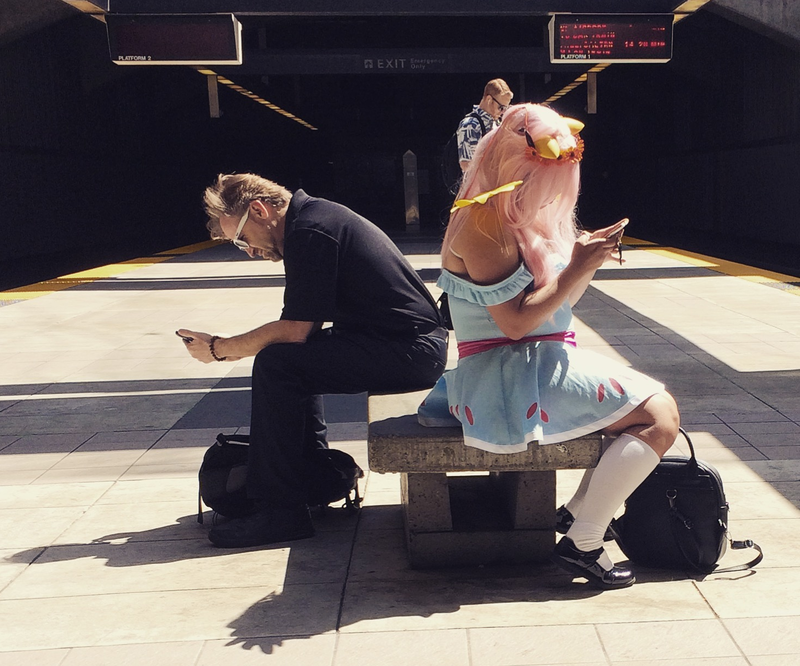 The Zero Moment of Truth has progressed towards micro-moments of high intent and high engagement – many of which happen in spare moments, such as waiting in line and commuting. In these “I-want-to-know, I-want-to-go, I-want-to-buy” moments, we reach for our phone. On average, users check their phones 150 times per day. Companies need to be present during these micro-moments even for a chance to be within the consideration set. The journey often continues either on mobile, desktop, laptop or tablet – most people have 2-3 devices that they move between. Google’s John Venverloh reported that 52% of online customer journeys take over 19 days; and that’s just for consumer purchases. Complex business purchases can take several months, or years. As digital marketers, understanding our customer’s voice, behavior and idiosyncrasies become even more important as we look to develop real-time experiences built around micro-moments of truth. And when we consider mobile within this context, it becomes part of a much bigger digital strategy and experience. It’s more than just a standalone channel. It is way beyond an algorithm update. If you’ve been tasked with improving the organic visibility of your website in the search engine results, one of the first places to start would be an SEO audit of your website. Here are 5 key steps that can help support an SEO website audit. Whilst this is not intended to be an all-encompassing audit list, it does provide some basic check points that can help you begin gathering key website insights. Also included are some examples of free SEO tools you can utilize along the way. Out of all site traffic, how much organic traffic is being driven to your site from search engines (volume and percentage)? What search terms are people coming into your site from? How much is branded vs. non-branded? For non-branded traffic, what kinds of non-branded words are bringing users in? URL Structure – Simply take a look at your browser URL address bar and drill down several pages. Are URLs clean, descriptive and keyword focused? Are they close to the domain root? Are multiple words separated by hyphens? Title Tags – Look at the title that appears on your browser tab, or open source code of a few key pages and search for <title>. Are Title Tags keyword focused? Does it include your company name? Are they within the character limit? Header Tags – Open the source code of a few key pages and search for “<h1>”. Are H1 tags present and keyword focused? Meta Description – Open the source code of a few key pages and search for “description”. Are unique meta descriptions present on pages? Are they catchy, provide a call-to-action or next step, and within 155 characters? Image File Names and Alt Text – Open the source code of a few key pages and search for “.jpg” and “alt=”. Are file names and alt tags present and keyword focused? Are key product/service areas split out by preferred landing pages? Is there onsite search capability? How about sitemaps? Have these been submitted through Webmaster Tools? Are they listed in the robots.txt file? Is the content relevant? Is the topic interesting? Is the amount of content substantial or shallow? Can content be easily shared? Are there ads that appear above the fold? If so, what’s the ratio of ads to content? How are users navigating through content? 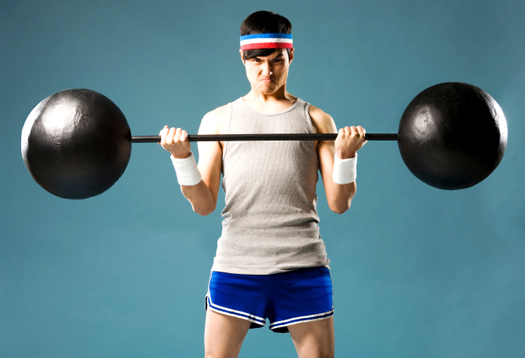 Are users bouncing off key pages as soon as they arrive? How many links do you have coming in to your site? What kinds of sites are these links coming in from? What is their domain authority? What’s the mix between .com, .edu, .gov, .org? How many are directories? What anchor text is being used to link to your site? Is it keyword focused? Is there anchor text variation? 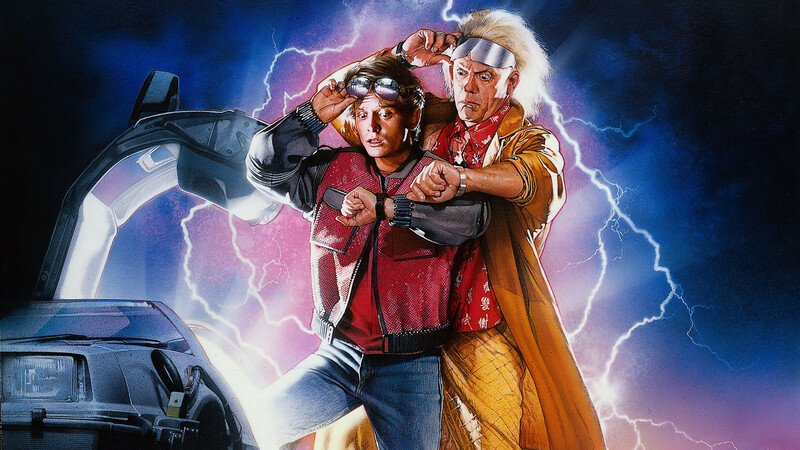 Even though hoverboards, flying cars and power laces may not see the light of day this year, Back to the Future II made some pretty good predictions about 2015 including 3D experiences, video chat and wearable glass technology. Gone are the days when companies could post a message on their Facebook page and have every page liker see it in their news feed. With more and more content flooding people’s feeds, organic posts on Facebook will become a waste of time and the only way for businesses to effectively reach their audiences through Facebook marketing will be through paid ads. In 2014, everyone and their grandmothers jumped onto the content bandwagon. For consumers there was so much content noise that information gems became harder to find, and many companies who had developed great content were struggling to reap the rewards. In 2015, businesses will work harder to cut through the noise and get their content found through more thoughtful social strategies and end-to-end search engine optimization. Those businesses who apply SEO – not just as an afterthought but throughout the entire content development process (from subject identification to how and where content is served) – will be the ones who see most success in 2015. 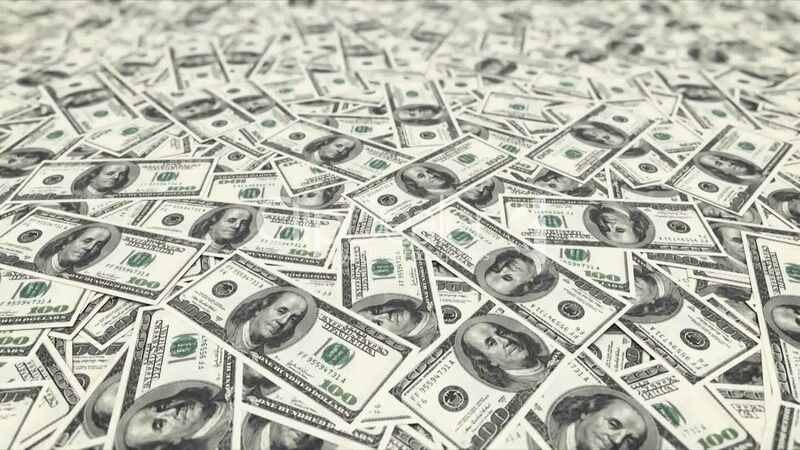 With companies allocating more budget towards social media, further fueled by the shift from organic to paid methods, questions around the measurable return on social media spend (and how this compares to other marketing channels), will become ripe. CMOs and finance departments will be demanding answers. 2015 will see the introduction of more tools (from both networks and developers) that help businesses to better track and understand, not just simple engagement measures, but the monetary ROI on social media spend. Ever since the release of the iPhone in 2007, search marketers raved about the year of mobile. Each year, it became as painful to hear as the “SEO is dead” mantra. But in 2014, desktop search declined by $1.4 billion as people shifted to mobile (eMarketer, 2014) and for the first time ever, mobile usage overtook desktop. After seven years, the “year of mobile” had finally arrived. So what next? The “year of wearable technologies” of course! With Apple’s release of the Apple Watch this year, wearable technologies will become available not just to the Scoble’s of the world, but to everyone. And while the mass adoption of wearable search will come much, much later, 2015 will see the start of glanceable content, a further evolution of mobile ranking factors, and more advanced map optimization (including super-specific location and distance factors). Suddenly, local search will become a whole lot more important to all businesses – local and global. With this, expect more pigeon updates in our not-so-distant future. In order for search to become truly effective, it can no longer operate within a siloed department. Search marketing knowledge will become more of a sought after skill across all marketing functions. And as savvy search marketers work to educate and incorporate search practices, SEO will start to become much more integrated across marketing, web and IT departments. With this, kneejerk reactionary tactics (in a “Quick! Let’s update all of our sites to https!” fashion) will decline as marketers focus more upon creating fundamentally good content built primarily around user (not just engine) experience. When it comes to digital marketing, measures like search engine rank, website visits, conversions and leads only tell half of the story. What the C-Suite really want to know is the ultimate KPI: how much is marketing really contributing towards the business? Marketing leaders in particular are looking to show the value of the marketing department as a profit (not a cost) centre. Positive reinforcement of sales behavior is important, particularly when this process is first rolled out. Often this is achieved through various incentives and ensuring it is included within everyone’s annual performance plans. Campaign codes are used to show where a marketing lead derives from – be it an event, email, telemarketing, the web, or elsewhere. Marketing campaign codes are pretty standard practice in most organizations. No lead should exist within the marketing database without one. Marketing campaign codes only tell you the very broadest source of a marketing inquiry so for something like the “web”, this is a pretty big bucket. Did these people come to the website directly? Or did they come through search engines, display advertising, social media, or from another website as a referral? This level of visibility can be achieved through URL tracking codes. Source (referrer information): EG: Google, Facebook, YouTube, etc. Google’s URL builder can be used to help build out parameter information. These codes then need to be passed into an appropriate field in your marketing/sales database so that the information is incorporated within the inquiry/lead record and carried through to the opportunity being closed out by sales. Finally, monthly reporting (accompanied by weekly run rate reports) will help you to keep track of the marketing contribution to sales numbers and provide ongoing visibility throughout the organization.